Eight years ago, I spent a 12-month stint living in Madrid, Spain. Much of that year involved exploring the region and finding delicious meals and local cuisines. But of course, I’m a pizza junkie, which was something of a challenge in that area. The pizzerias I found in Spain were few and far between — and for the most part, reflected the Spanish tendency for drier foods, like their beloved cured manchego cheese. Dry cheese and bread — that’s one of their actual sandwiches. Nothing else, no spreads or tomatoes or cold cuts to lubricate the taste buds. Just dry bread and dry cheese. 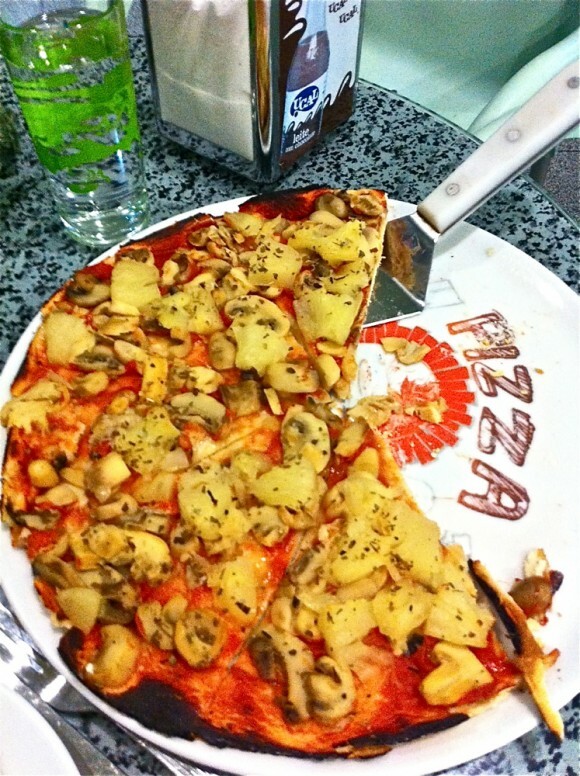 And the Spanish pizza was pretty much the same thing. I also spent one weekend of that year in Lisbon, a few hours west of Madrid. I was able to sample some local pizza at an Italian/Indian combo restaurant — something I’ve never seen before — and found that their naan-like dough actually worked pretty well. A novelty, but not anything I spent much time thinking about after my return to America. Fast forward through most of a decade, where, at least States-wise, many things changed in the pizza world. A wood-fired Neapolitan pizza renaissance hit the tipping point in recent years, where you now can find envy-inspiring imported Stefano Ferrara ovens in shopping mall food courts. Still, I didn’t expect any major differences in Iberian pizza as I recently packed for a two-week trip to Spain and Portugal, my first return since that year abroad in 02/03. In between stops at my old favorite paella places and late-night chocolaterias, I began to notice something interesting: pizzerias. Lots of them, maybe one every couple blocks in some areas. On the side streets and winding alleyways around Puerta del Sol, up Fuencarral (now a busy pedestrian-only boulevard, instead of the roadway I used to walk up). There was even a tasty-looking pizza joint on the ground floor of my old apartment building, literally one window below my former bedroom (that would have been dangerous). 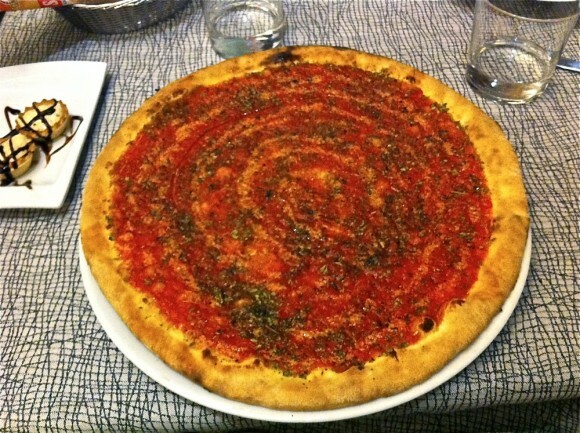 Finally, I stopped at a place I was walking past and ordered a simple marinara with mushroom pie. The Brazilian-flag-bandana-wearing pizzaolo got to work. 5 minutes later, I got my 13″, crispy, sauce-laden pie out of his electric oven. The outcome was a revelation: Madrid was suddenly in the pizza game. That discovery in Madrid was great, but Portugal was the primary focus on this trip, where I spent most of the two weeks. And as soon as I arrived in Lisbon, I noticed an Italian/Indian restaurant — but not the same one I went to in early 2003. Apparently, this is a common restaurant in that country, as I saw plenty of them all the way from Lisbon to Oporto. 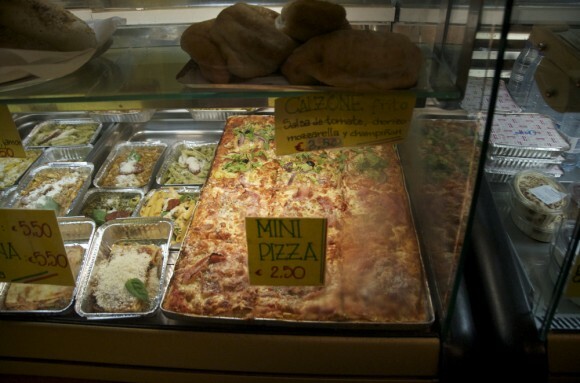 As someone who enjoys both cuisines (who grew up with an Italian grandmother), I don’t know if I fully see the connection. 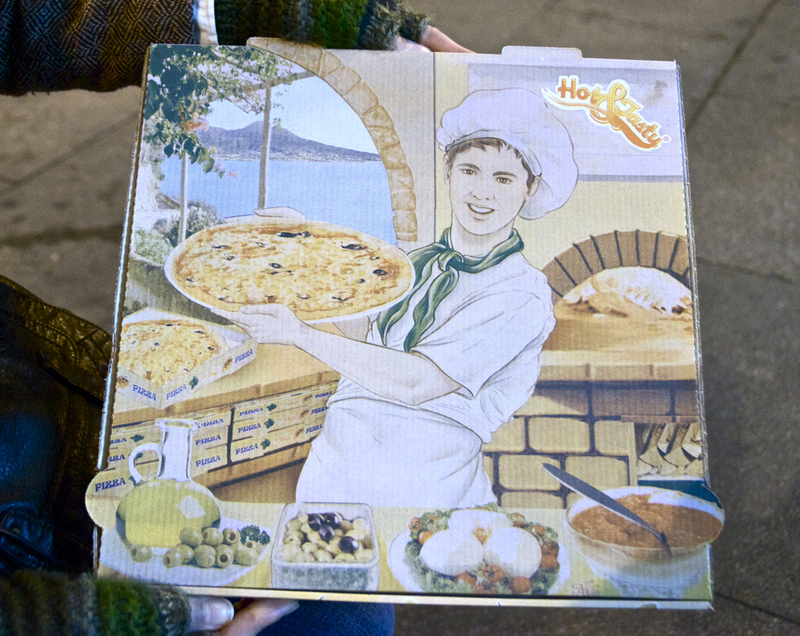 This time I only sampled one Indian/Italian pizza, at a lunch place in Sintra, a touristy area full of palaces and castles you can tour, 30 minutes from Lisbon on train. Sort of like eating pizza next to Hearst castle, it was easily the worst meal I ate on the trip. 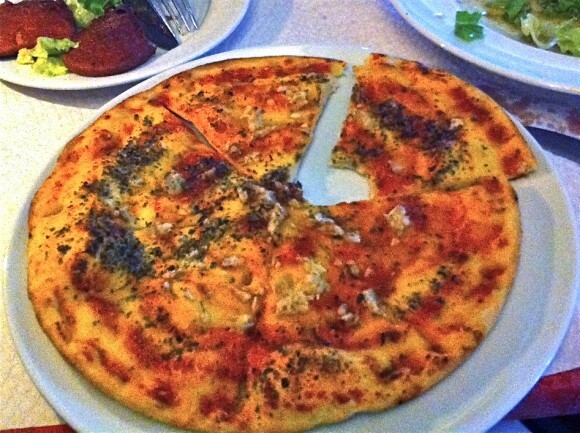 It was more like a doughier version of an overcooked pancake with a tiny bit of gross sauce and a lot of garlic and oregano. But aside from that, and the mushroom/pineapple pizza that was ordered out of sheer necessity while stranded in a small-town bakery/cafeteria during a rain storm, the pizzas I had in Portugal were pretty good. 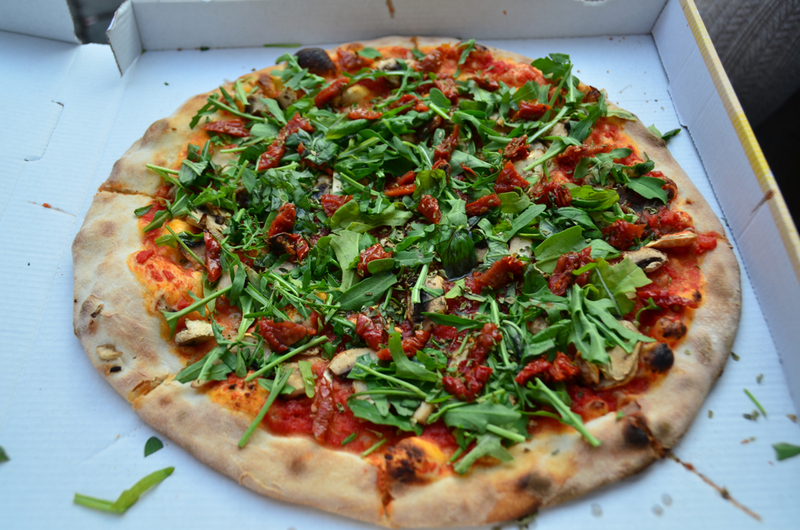 Esperança in Lisbon served up a deliciously thin and crispy mushroom pie, which I followed up with a cherry tomato and olive pizza a week later. 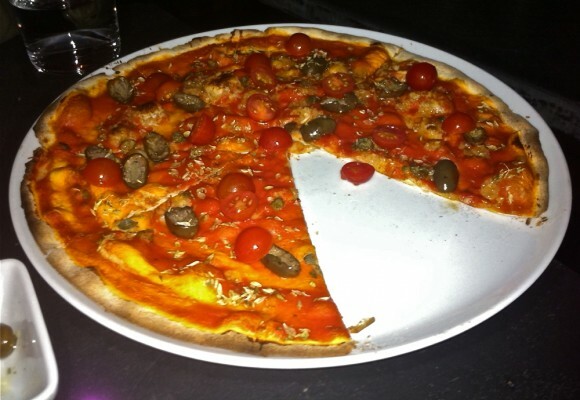 And an upscale spot called Nosolo Italia, next to the Monument of Discovery and Torre de Belém, had a similarly crispy approach, and was the first place where I saw the “Tropical” pizza — with bananas, peach slices, walnuts, and other fruits. I’m trying to find a photo of that one. 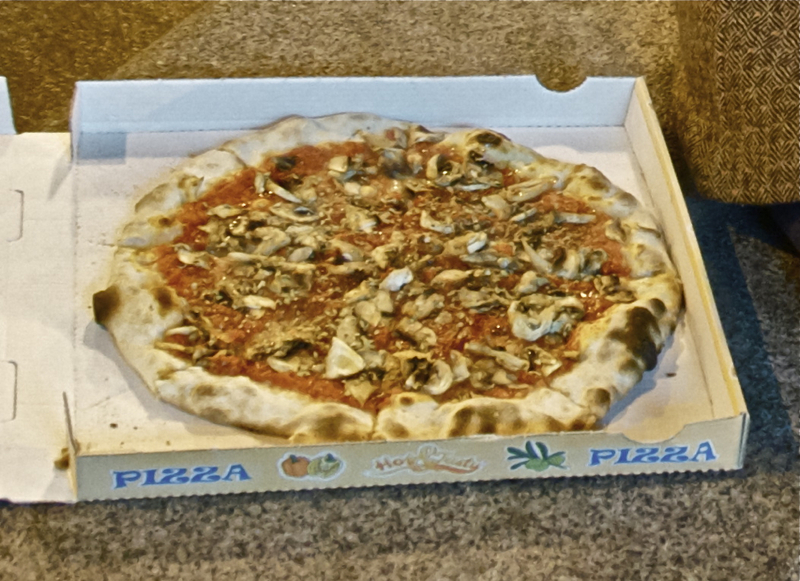 On the departure, I had one additional night in Madrid and made sure to stop at the same spot I got that first pizza at. 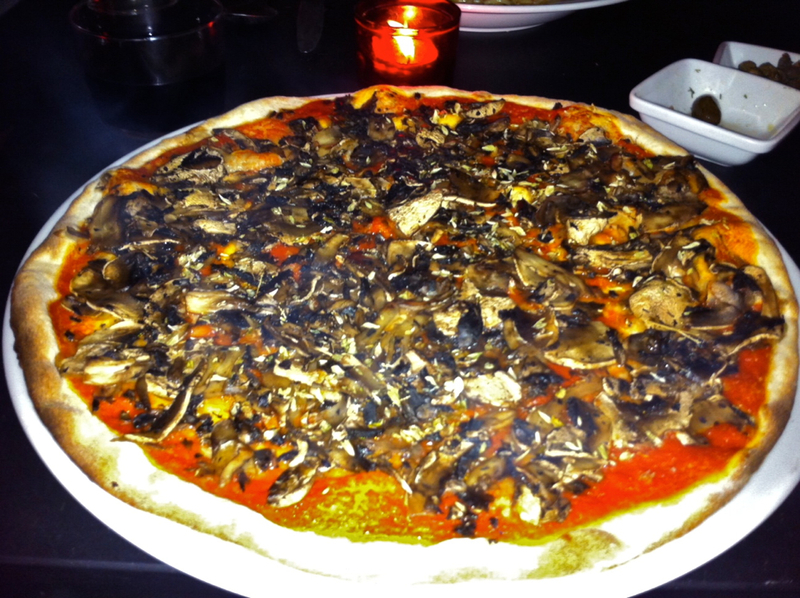 This time I ordered a sundried tomato, mushroom, arugla and basil pie, which came out even tastier than the first time. Later that evening, with some spare euros burning a hole in my pocket, I popped into a pizzeria downstairs from my hotel that had a wood-fired oven which was cranking out pizzas in 2-3 minutes. Just a plain Marinara from them, which was tasty and filling, but surprisingly one step below the spot with the electric oven from earlier that day. 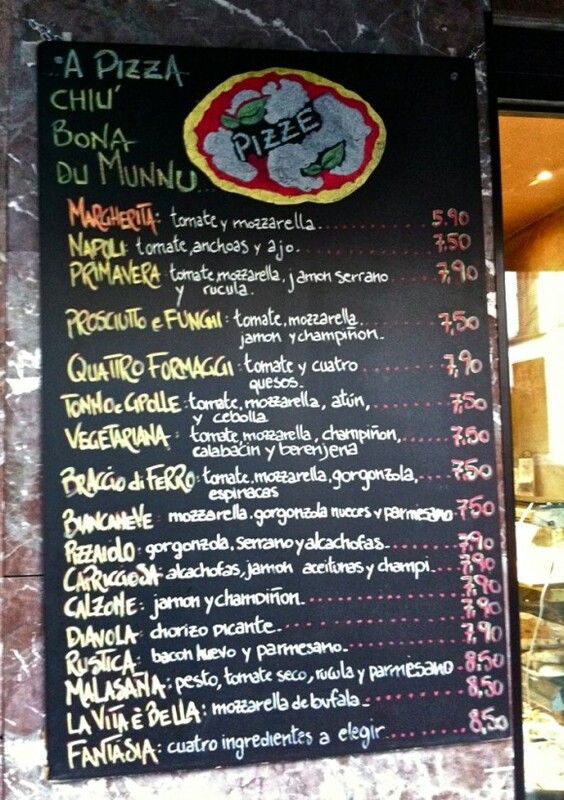 The last thing I saw as I was headed out of the city the next morning was a spot on Gran Vía called Pizza Marzano. An intriguing name as it has some serious Neapolitan connotations. I’ll have to check it next time I’m out there, hopefully sooner than eight years from now. Hi, I'm Mike. I’m the executive editor of Make: magazine, and host of Discovery channel’s Punkin' Chunkin' and Catch It Keep It, TV shows where I build and explain crazy machines that crush stuff, blow things up, shoot fire, all in the name of science. I've previously worked at Wired and ReadyMade magazines, writing about how to utilize new technology in our everyday lives. This site is where I keep a list of instructions for fun projects I've done, am working on, or draw inspiration from. I encourage everyone to get involved — get up and make something! New product in my store — mini skull silicone molds! Cast your own mini skulls in anything you want — chocolate, ice, plaster, etc. What If I Had Bought Bitcoins Instead of Backing Kickstarters?